Google Earth is by far the best source of geographic information on the web. 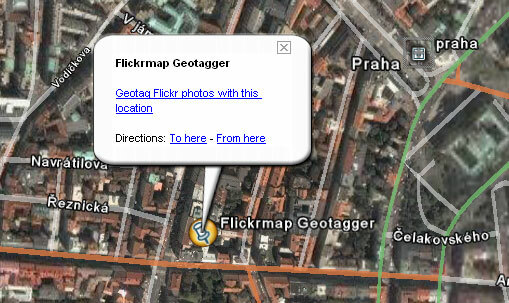 Combined with the Trippermap Geotagger you can easily add geographic information or "geotags" to your own Flickr photos. Adding geotags allows you to use various web scripts and applications designed by the Flickr community. 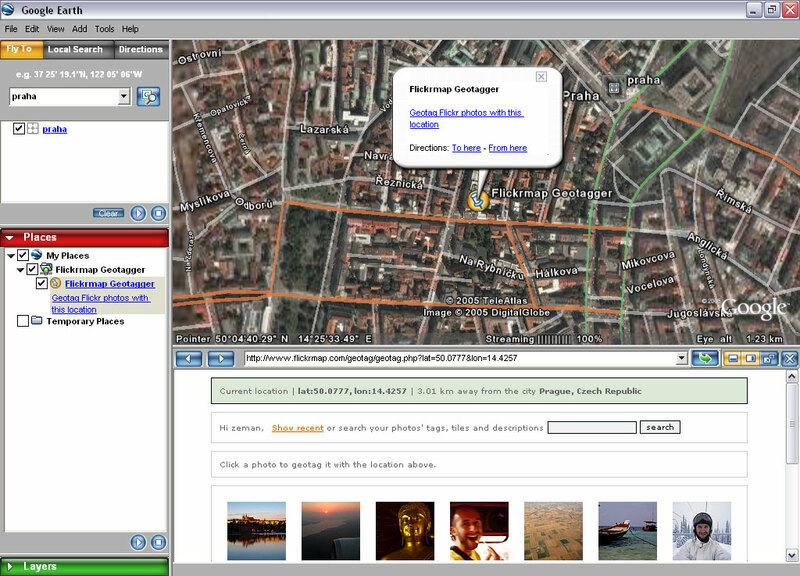 Check out GMiF (Google Maps in Flickr), Geobloggers or our very own Trippermap. Note: The Trippermap Geotagger works on both the windows and mac versions. You don't have to be subscribed to Trippermap to use the Geotagger. It's a free service to the Flickr community! If you want to see your geotagged photos on a really cool map on your own website then you can subscribe to Trippermap. Instructions - Know what you're doing? 2. Right click on the Trippermap Geotagger and choose "Save to my places". 3. Move the map so the location you want to geotag is in the center of the screen. 4. As soon as you stop moving the map the Trippermap Geotagger placemark will appear in the center of the map. 5. Click the place mark and follow your nose. Right click on the Trippermap Geotagger which has appeared under Temporary Places and choose "Save to my places". 2. In "Tools > Options" click on the "Preferences" tab and uncheck the "Show web results in external browser" option. Click "OK". 3. Navigate and zoom in Google Earth so that the location you want to add to your photos is in the center of the map window. 4. A "Trippermap Geotagger" placemark will appear in the center of the screen. Move the map if the placemark is not in the location you want. Every time you stop moving the map the placemark will automatically refresh and move to the center of the screen. 5. Click on the placemark and in the popup description click "Geotag Flickr photos with this location". The web panel will open and the Trippermap Geotagger will load. You can adjust the web panel size to see more of the Trippermap Geotagger if necessary. 6. The Trippermap Geotagger will show you the latitude and longitude of the placemark and the nearest city to that location we have in our database. The city name is to help you confirm that you've got the right location. At the start of each geotagging session you will be asked to authenticate the Trippermap Geotagger with your Flickr account. This is so we can add tags to your Flickr photos. Click on "Authenticate". If not already signed in at Flickr you will be asked to do so and then the first time you use the Trippermap Geotagger you will be asked if you want to allow the geotagger permission to write to your Flickr account. Click "OK, I'll allow it". 7. Browse through your recent photos or search the tags, titles and descriptions of your photos until you found the photo(s) you want to tag with the current location. 8. Simply click on each photo you want to geotag and we'll add the tags to your photo. 9. The next time someone views your Trippermap the newly geotag photos will be displayed on the flash map. 10. That's it... show your map off to your friends!